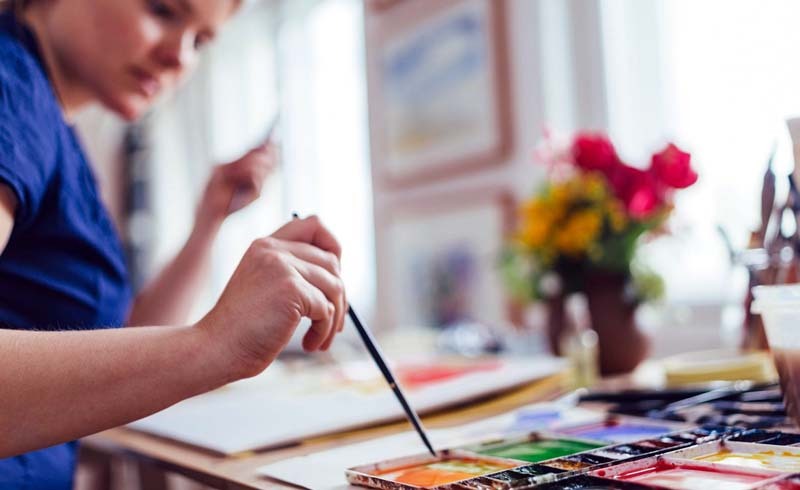 Artists have been painting with oil paints for hundreds of years and oil paints continue to be popular worldwide due to their versatility, quality, and color. While getting started with oil painting is fairly easy, there is a little bit more to it than acrylics, since you are working with toxic solvents and mediums and the drying time is much longer. Individual artists who have been painting for a while have their own favorite brands, brushes, palettes, and mediums, but here are some general tips that may be useful to you if you are just starting out with oil paints. Set up a space in a well-ventilated area where you can keep your palettes and supplies out and at-the-ready and your paintings visible.This will give you the chance to see and think about your work, even if you're not actually painting. It will also make the process of painting easier so that you will be inclined to paint more often, even daily if possible. Your work will improve rapidly if you paint a lot. This is the practice of making art. Painting small gives you the chance to try out techniques and experiment with color without investing too much time or material into the process. You can buy some small 8x10 inch canvases or canvas boards, or even try painting with oils on paper. (Remember to gesso the paper first). You can paint on many different surfaces—canvas, wood, paper—but whichever you choose, it's important to apply a type of primer called gesso to the painting surface to prevent the oil from seeping into the surface, protect the surface from the acids in the paint, and provide a surface that the paint will adhere to more easily. You can also use pre-primed boards or canvas and apply another coat or two of gesso to them if you like a smoother surface. Ampersand Gessobord is a nice smooth durable surface to work on. Buy professional grade paints as you can afford them rather than student grade. Professional grade has a greater ratio of pigment to binder. Buy only a few higher quality brushes—three different sizes should be good to start with. You can buy more and experiment with the different shapes as you paint more. You can use synthetic brushes made for acrylic paints for oil, but there is also a range of natural hair brushes that can be used with oil. Bristle (hog) brushes are the most commonly used. Primary paint colors are not "pure" but rather lean toward either yellow or blue, making them warm if toward yellow, or cool if toward blue. This influences how the primary colors mix to produce the secondary colors. Don't feel that you have to use all the colors in your painting at once. Start with a monochrome painting, a painting of only one hue plus its shades (black added) and tints (white added). You can use any color you like depending on whether you want a cool or warm painting. This will allow you to get the feel of the paint. When you are ready, add a warm and cool of each primary color to your palette, along with earth tones like burnt sienna, burnt umber, and yellow ochre. This is a thin underpainting consisting of a color and turpentine (or odorless turpentine substitute such as Turpenoid). This will dry quickly so that you can then add subsequent layers of paint and color without having to wait too long for it to dry. Burnt sienna is useful to lay out values and composition, whether you work on a white canvas or tone it with a neutral gray first. Paint thick over thin, fat over lean, and slow-drying over fast-drying. That means using thinner paint and less oil in the first layers, saving thicker paint and higher oil content for later layers. This will help ensure that earlier layers dry first and will help to keep your painting from cracking. Start with an underpainting of paint and turpentine, then move to a painting medium of a combination of turpentine and linseed oil in a ratio of 2:1. Linseed oil can yellow with age (which is more apparent on light colors) but dries faster than other oils. It's important to clean your brush between colors and with soap and water when finished painting. Oil painting can get messy. Have paper towels and rags handy to wipe excess paint and turpentine off your brushes. Have two containers available while painting—one for turpentine for cleaning your brush between colors and one for medium to mix with your paint. Oil paints and mediums are toxic if ingested or absorbed into the skin. Keep them put away and out of reach of pets and small children. Dispose of paints, mediums, rags, paper towels, and disposable paper palettes or paper plates (also good to use as palettes) properly. You should wet or soak rags and paper in water before discarding them since they are flammable, can heat up when drying out, and sometimes spontaneously combust.